Each mine must at some moment be vacated by its occupant. The opening that is made then often has a very constant shape. In those Agromyzidae species where the mine is left prior to pupation, the larvae make neat semicircular exit slit in the epidermis. Often it is a constant feature of a species whether its exit slits are made in the upper or lower epidermis. 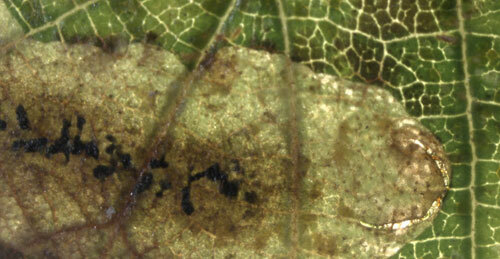 In Phytomyza minuscula, a species with an upper-surface mine, the exit slits are invariably in the lower epidermis. In Stigmella-species the exit slit is more highly arched; here too the the position of the exit slit often just as constant as that of the egg. Most mining larvae spend their entire life within a single mine. 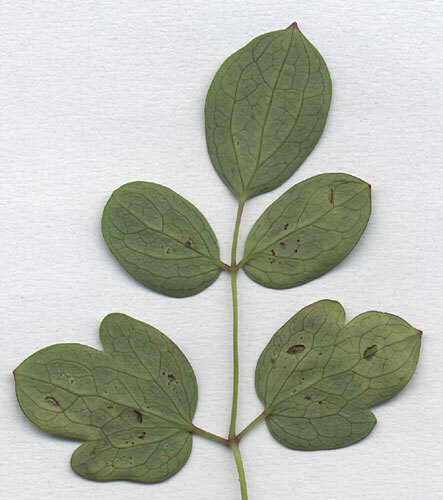 There are, however, species that are capable to move to another (part of the) leaf and start a new mine. An odd species goes ‘through the house’, tunnelling through petiole, stem and petiole to a new leave. Most actually leave the protection of the mine, and bore themselves in elsewhere. With a bit of luck it sometimes is possible to see the opening that is made by the larva while reentering. Many species lack the possibility to reenter a leaf: bracing yourself firmly, gnaw a hole in the epidermis and bore yourself in often goes beyond the capabilities of a larva. Openings in the mine often have the principal role to enable the ejection of frass.